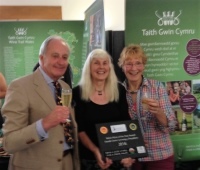 Our Dathliad Sparkling was awarded the "Best Welsh Wine in the Competition" trophy at the English & Welsh Wine of the Year Competition 2016. We also achieved silver and bronze medals for our red and dry white wines. 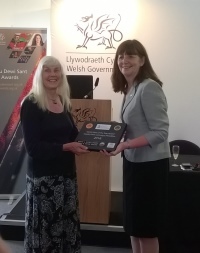 The trophy was given by the Welsh Assembly Government & presented by Lesley Griffiths (Minister for Environment, Food & Rural Affairs at the Royal Welsh Show on 18th July. It was also presented at the U.K.Vineyards Assn. 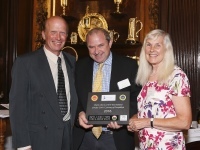 presentation dinner held at Vintners Hall in London. Our wines have won many awards since we entered our first competition in 2002 when we gained a silver award for our Bacchus blended dry white from 2000 in the S.W. Vineyards Association competition.